Savvy shoppers know that eating healthy on a budget doesn’t have to be difficult or limiting. With today’s economy consumers are looking for ways to cut down on the cost of their grocery bill without sacrificing health. It is not necessary to shop at special health food stores or purchase fancy products in order to maintain a healthy diet; in fact the healthiest foods in the grocery store are also the most economical. Consider that meat-free options such as beans, legumes, nuts, seeds and soy are some of the healthiest and least expensive sources of protein in the store and they’re shelf stable! At about $0.17 cents a piece, eggs are another economical source of protein. Eggs are healthy, versatile and easy to prepare. So where do we go wrong? Processed and convenience foods. Some of the most expensive items in your cart are soda, convenience items such as individually packed snacks, chips, instant oatmeal, rice and other grains. You’ll stretch your dollar by purchasing the largest pack possible and portioning out yourself. Buy the largest frozen bag of veggies without added sauces. Frozen veggies are picked at their peak of ripeness and frozen immediately to preserve nutrients. Canned fruit in its own juices is a great choice all year long – stock up when these items are on sale. Meats – Chuck or bottom round roast has less fat and is less expensive than sirloin; buy a whole chicken and cut it up yourself instead of purchasing it cut up for you. Fish – tilapia & cod are leans choices that are usually priced right. Buy meat in large bulk packages to save money. Freeze portions you use right away to prevent spoiling. Use within three months. Combine filling ingredients in a 7 to 10-inch nonstick pan. Cook and stir over medium heat until water has evaporated and vegetables are crisp-tender, 3 to 4 minutes. Remove from pan; keep warm and clean pan. Beat eggs, 1⁄4 cup water, cheese, basil and garlic powder in medium bowl until blended. Heat butter in same pan over medium-high heat until hot. Tilt pan to coat bottom. Pour in 1⁄2 of the egg mixture. Mixture should set immediately at edges. Gently push cooked portions from edges toward the center with rubber spatula so that uncooked eggs can reach the hot pan surface. Continue cooking, tilting pan and gently moving cooked portions as needed. When top surface of eggs is thickened and no visible liquid egg remains, place 1⁄2 of the filling on one side of the omelet. 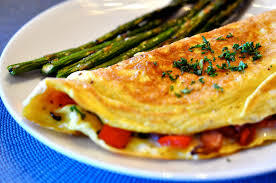 Fold omelet in half with spatula and slide onto plate; keep warm. Repeat with remaining egg mixture and filling to make second omelet. SERVE immediately. 205 Calories; 14g Fat; 6g Saturated fat; 2g Polyunsaturated fat; 5g monounsaturated fat; 384mg cholesterol; 174mg Sodium; 5g Carbohydrate; 1g fiber; 15g protein; 1,385 IU Vitamin A; 261mg choline; Excellent source of protein, vitamin A and Choline. Vitamin A & D. 37% less fat than regular milk. Fat reduced from 8 g to 5 g. Grade A. Pasteurized. Homogenized. Gluten free. Happy holidays! Our farmers pledge no artificial growth hormones (No significant difference has been shown in milk from cows treated with the artificial growth hormone rbST and non rbST treated cows). Backed by our five point purity promise. $1.00 off any half gallon of McArthur Egg Nog. See back for details. www.dairypure.com. Comments? 1-800-395-7004. Oscar Mayer Bacon Naturally Hardwood Smoked. America's favorite. U.S. Inspected and passed by Department of Agriculture. Net Wt 16 oz (1 lb). Since 1924. The slower we make it, the faster you eat it. What is there to think about The Bacon all other bacons aspire to be is in your hands. There's a reason we're America's favorite brand of bacon and it's not just because we've been crafting it for 90 years. We take our sweet, delicious time curing it for 12 hours and then sending it off to our natural hardwood smokehouse for hours. Just don't blame us if it only lasts 12 seconds. 12 Hours cured. Naturally Smoked for hours. Smoked with Natural Hardwoods. Gluten free. Pork used raised without hormones. Federal regulations prohibit the use of hormones in pork. For great tasting bacon when you're in a hurry, try Oscar Mayer Fully Cooked Bacon. Please have package available. Call: 1-800-222-2323. Visit us at www.oscarmayer.com. © Kraft Foods. Grade A. Stays fresh. Happiness inside us! From East to the West Sunshine Farms is the best! Gentle care. Simply fresh, simply delicious, simply for our families. Please visit our website at: www.sunshinefarmsinc.com. Per Egg: 90 calories; 2 g sat fat (10% DV); 90 mg sodium (4% DV); 0 g sugars; 8 g protein (16% DV); 1 mcg vitamin D (6% DV). See nutrition information for cholesterol content. Vitamin A: Maintains the skin, immune system and normal vision. Vitamin B12: Aids energy, metabolism, red blood cells and the nervous system. Vitamin D: Keeps bones and teeth healthy and aids absorption of calcium. Vitamin E: Aids nervous system function, contributes to a healthy immune function. Biotin: Aids energy metabolism. Folic Acid: Aids blood formation and tissue growth during pregnancy. Iodine: Aids thyroid gland function, plays an important role in development of the central nervous system. Iron: Assists red blood production and the transportation of oxygen throughout the body. Lutein and Zeaxanthin: Maintain normal vision. Protein: Needed for building and maintaining muscle, organs, skin and tissue, and producing antibodies, enzymes and hormones. Selenium: Protects cells from oxidative damage, maintains the immune system and aids thyroid gland function. Martin's® Potato Sandwich Rolls. #1 Branded hamburger roll in America. The Taste Is Golden®. Delicious to serve at the nicest dinners. Famous Dutch taste. Per 1 Roll serving: 130 Calories. 0g sat fat, 0% DV. 180mg sodium, 8% DV. 5g sugars. 7g protein, 15% DV. Maxi mmmm flavor our home recipe. Potato rolls and bread. What makes the perfect roll Soft and tastes great. No high fructose corn syrup. No artificial dyes. No azodicarbonamide (ADA). No trans fats. Non-GMO*. Contains B Vitamins, calcium, & iron. Good source of protein! (*We source non-GMO ingredients. For more information, go to our website: potatorolls.com/about/faqs). High quality ingredients = great tasting rolls and bread! We use high protein wheat flour, nonfat milk, potatoes, real cane sugar, yeast, and butter in our bakery products. We believe that our high quality ingredients and our dedication to excellence are what has made "Martin's famous potato rolls" the preferred choice in America for the past 50 years! May God bless all our customers with goodness and health! We appreciate every one of you! From The Martin Family & Martin's Team. American family owned and operated. 1-800-548-1200 (8 am - 5 pm/M - F). www.potatorolls.com. Martin's Famous Pastry Shoppe, Inc. Known as a slicing cucumber, Hothouse cucumbers range in size from 6 to 9 inches, and its dark-green skin is usually waxed to prevent moisture loss. The English cucumber, which may be called seedless, European, burpless, or hothouse (which is where it is commercially grown), grows to between 1 and 2 feet in length. Natural ginger flavor with other natural flavors. Caffeine free. 120 calories per 12 fl oz serving. Since 1783. Please recycle. Consumer comments? 1-866-Schweppes. Garelick Farms® Dairy Pure® 1% Lowfat Milk. Since 1931. Our farmers pledge: No artificial growth hormones*. Backed by our five point purity promise.™ Vitamin A & D. Half gallon (1.89 L). Grade A. Pasteurized. Homogenized. Gluten free. *No significant difference has been shown in milk from cows treated with the artificial growth hormone rbST and non rbST treated cows. Comments Call: 1-800-395-7004. Visit: www.dairypure.com. 110 calories per 8 fl oz serving. Pasteurized. Non GMO Project verified. nongmoproject.org. As much calcium as a glass of milk. Never from concentrate. 100% juice. Enjoy Tropicana! Questions or comments? Call 1-800-237-7799. www.tropicana.com. Please recycle. Contains orange juice from US and Brazil. Vegetarian fed hens. Farm fresh. Americas Superior Tasting Egg. USDA A Grade. Now! For your nutritious diet. Excellent source of Vitamins D, E, B2, B12, B5. Plus - 140 mg Omega 3. 25% less saturated fat than regular eggs. Egglands best eggs just got even better! Farm fresh Egg-Land's Best eggs have always been recognized for their exceptional taste. In fact, we've been awarded the Gold Seal as America's Superior Tasting Eggs by the American Masters of Taste. Now, in addition to their great taste, they are an excellent source of vitamin D, vitamin E and vitamin B2 (riboflavin), vitamin B12 and vitamin B5 (pantothenic acid) and also a good source of folate. Plus, our eggs contain 125 mg of omega 3 fatty acids and 200 mcg of lutein and have 25% less saturated fat than regular eggs. How does Eggland's Best produce such nutritious and great-tasting eggs? We feed our hens an improved wholesome, all-vegetarian diet with no animal fats or animal by-products. Laying hens' diets contain no added hormones. Antibiotics are not used in the production of Eggland's Best eggs. The results: our all-vegetarian diet produces important nutrients and the best taste possible. So you can eat even healthier while enjoying the same great right-from-the-farm freshness and taste of Eggland's Best eggs! Recommended American Diabetes Association/American Dietetics Association Dietary Exchange: 1 Egg-land's Best egg for 1 medium-fat meat. BrandSpark. Most trusted by shoppers. Voted most trusted egg brand by American shoppers. Based on the 2017 BrandSpark Study. Saturated fat 25% less than ordinary eggs: 1 g vs. 1.5 g (quantities rounded). If you are concerned about cholesterol, follow a diet lower in saturated fat and cholesterol and ask your doctor or dietician about Eggland's Best clinical studies. For Kosher Questions: See www.oukosher.org. Visit www.egglandlandbest.com for additional information. Questions or comments call 800-922-3447 or visit www.egglandsbest.com. Martin's® Potato Rolls Long. Famous Dutch taste. The taste is golden®. Per 1 roll serving: 140 Calories. 0.5g Sat fat, 3% DV. 180 mg Sodium, 8% DV. 5g Sugars. Net Wt. 15 oz (425 grams). America family owned and operated. We use high protein wheat, flour, nonfat milk, potatoes, real cane sugar, yeast, and real butter in our bakery products. We believe that our high quality ingredients and our dedication to excellence are what has made "Martin's Famous Potato Rolls" the preferred choice in America for the past 50 years! From Martin family & Martin's Team. Made with unbleached flour and has a buttery taste. Delicious to serve at the nicest dinner. Maxi mmmm flavor our home recipe. What makes the perfect roll Soft and tastes great. No high fructose corn syrup. No artificial dyes. No azodicarbonamide(ADA). No trans fats. Non-GMO*. Contains B vitamins and calcium. HIgh quality ingredients = Great tasting rolls and bread! Reg. PA Dept. Agr. *We source non-GMO ingredients. For more information, go to our website: www.potatorolls.com/about/faqs. Call 1-800-548-1200 (8 am - 5 pm / M-F). Visit www.potatorolls.com. Milk's favorite cookie. Per 3 Cookies: 160 calories; 2 g sat fat (10% DV); 135 mg sodium (6% DV); 14 g sugars. Slit appears when opened. Carry love in your heart and Oreo cookies everywhere else. Wonderfilled. Produced with genetic engineering. Visit Us at: oreo.com. Made in Mexico. Martin's® Sandwich Potato Bread. Famous Dutch taste. Enriched bread. Made with unbleached flour and has a buttery taste. Per 1 slice serving: 90 Calories. 0g Sat fat, 0% DV. 110mg Sodium, 5% DV. 3g Sugars. Net Wt 18 oz. (1 lb. 2 oz.) 510 g. American family owned and operated. High quality ingredients = Great tasting rolls and bread! We use high protein wheat flour, nonfat milk, potatoes, real cane sugar, yeast, and real butter in our bakery products. We believe that our high quality ingredients and our dedication to excellence are what has made "Martin's Famous Potato Rolls" the preferred choice in America for the past 50 years! The taste is golden®. Potato rolls and bread. What makes the perfect bread Soft and tastes great. No high fructose corn syrup. No artificial dyes. No azodicarbonamide (ADA). No trans fats. No cholesterol. Non-GMO*. Contains calcium. (*We source non-GMO ingredients. For more information, go to our website: www.potatorolls.com/about/faqs). Reg. PA Dept. Agr. Call: 1-800-548-1200 (8 am - 5 pm / M-F). Visit: www.potatorolls.com. Dr wt 4 oz. Premium tuna. Since 1899. www.bumblebee.com. Dolphin safe. Gluten free. 100% recyclable packaging. Per 56 g serving: 60 calories, 0 g sat fat (0% DV), 140 mg sodium (6% DV), 0 g sugars. See side panel for full nutrition facts. Excellent Omega-3 EPA & DHA source (Contains 40 mg of EPA and DHA combined per serving, which is 25% of the 160 mg daily value for a combination of EPA and DHA. American Heart Association Certified. Meets criteria for heart-healthy food. While many factors affect heart disease, diets low in saturated fat and cholesterol may reduce the risk of this disease. For inquiries concerning product include number shown on can end. Thoroughly washed. Preservative free. All natural. Salad Guide: taste = 3 (mild to bold); texture = 1 (tender). Pairs well with poppy seed dressing, sliced fresh strawberries, whole blueberries, and toasted walnut halves. Superfood for you immunity. Dole Spinach is a superfood for your immune system. Spinach contains vitamins A and C as well as antioxidant phytonutrients which all help support a healthy immune system. For more than 100 years, Dole has been committed to our environment, our employees and the communities in which we operate. Produce of USA. Per Serving: 30 calories; 0 g sat fat (0% DV); 60 mg sodium (3% DV); 4 g sugars; Vitamin A (110% DV); Vitamin K (15% DV). Low-fat diets rich in fruits and vegetables (foods that are low in fat and may contain dietary fiber, Vitamin A, or Vitamin C) may reduce risk of some types of cancer, a disease associated with many factors. Carrots are an excellent source of Vitamin A. Find Delicious Recipes: www.GreenGiantFresh.com. Follow us on: Facebook. Twitter. Questions or comments? 1-800-998-9996. Produce in USA. Heinz Tomato Ketchup. 57 varieties. Estd 1869. 57 varieties. Grown not made*. Only the best tomatoes for the best ketchup. Our *sun-ripened tomatoes, along with our passion and knowledge, give our tomato ketchup recipe its unique flavor. That's why every tomato in every bottle of Heinz® ketchup is grown from Heinz® seeds. Grown not Made®.... No other tomato ketchup tastes like Heinz® ketchup. Gluten-free. Questions or comments Call 1-800-255-5750 visit us at www.heinzketchup.com. Put on some salsa and let's dance! Good fun. No artificial flavors. No preservatives. No MSG. Gluten free. Questions or comments? 1-800-352-4477. Mon-Fri 9:00 am to 4:30 pm CT/email or chat at fritolay.com. Guaranteed Fresh: Until printed date or this snack's on us. Premio™ Sweet Italian Sausage. The Way Sausage Should Be™. U.S. Inspected and passed by Department of Agriculture. EST. 4780. No preservatives added. Fresh. Gluten free. No MSG added. No preservatives added. premiofoods.com. Nabisco Chips Ahoy Original Real Chocolate Chip Cookies. Where fun lives. Share me. Sooo good. Slit appears when opened. Sealed. Lift resealable package. Crowd pleaser. Yum. Yeah. Crammed with real chocolate chips. Greatness. Enjoy. Kraft Foods. Yes Please! For best when used by information, please see date printed on package. Visit us at: facebook.com/chipsahoy or call weekdays: 1-800-622-4726. ©Kraft Foods. Smooth original flavor. Nothing about this cigarette, packaging, or color should be interpreted to mean safer. Class A cigarettes. For Special Offers: Marlboro.com. Limited to eligible smokers 21+. For Product Information: 1-800-627-5200. PMUSA.com. Please don't litter. FSC.